Take the South Exit of Nerima Station, and go out to Senkawa St. Cross at the traffic light, heading towards Ito Kanamonoten (Ito Hardware Store), and continue down a narrow street until you see "Yoro no Taki" restaurant. Look to the right and you will see the skull that marks the spot of Trussrod! 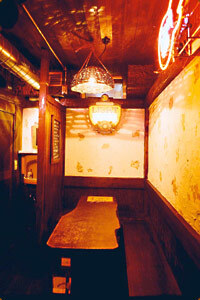 With the atmosphere of an "akachochin" pub, merely 15 chairs are found in this little bar. 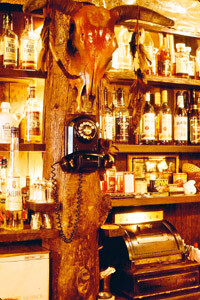 Self-designed by the owner in a Southwest style, the Native American influence can be found from the floor to the ceiling. 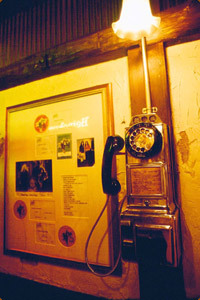 Even the 1960's American antique telephone and cash register, shown in the photo, are still used every day. The music played at Trussrod is mainly 70's and 80's classic rock, but also encompasses heavy metal, blues and even County & Western. Bourbon and whiskey dominate the full bar at Trussrod, but one can also find tequila, rum and many other exotic liquors and beers from around the world. Cocktails are also a specialty of the house, so even a woman on her own can come and enjoy the bar with peace of mind. 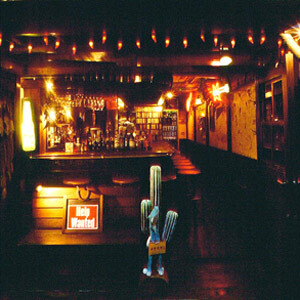 As for the food, Trussrod offers original TEX-MEX cuisine (tacos, chile con carnes, etc. 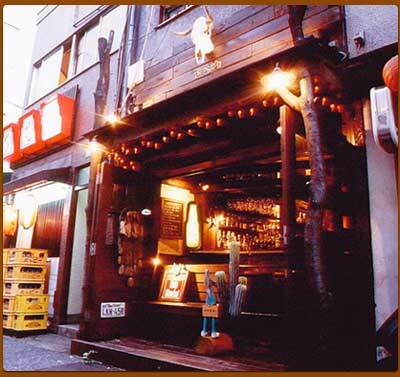 ), with Eddie's Chicken Curry, as featured on many TV programs throughout Japan, the a legendary favorite. Trussrod's motto is "With good sake, delicious food and rock & roll, we will give you energy for tomorrow", so come on down to Trussrod and have yourself a good ol' time!